Wednesday nights were my night. For an hour once a week I got to be upsidedown building my strength. Pole fitness or pole dancing, whatever you want to call it, is my absolute passion! I started on the pole back in 2011. Back then it wasn't really known about as much, it still had the fairly obvious stigmas attached to it, people didn't realise it could be done for fitness, not money! But having had a passion and qualifications for dancing at a younger age I was hooked after the 1st lesson. It was something for me. I could challenge myself each week to get better, build my strength and have a laugh with the friends I had made. When my husband and I found out we were expecting a bambino I was ecstatic and I hadn't even really considered giving up pole. I planned to continue through. You see a lot of pregnancy fitness mums who seem to work out right up until they pop, and I just assumed i'd be able to do the same, maybe a little more restricting be it pole fitness with a bump but I hadn't really considered the other side effects. 13 weeks in feeling completely exhausted I was already defeated. As a first time preggo I was also slightly nervous for the baby. I worried about how safe it was to do throughout my pregnancy. I believe it would have been ok to continue util 8 months so I was told, but my body and my mind were telling me to stop which was in itself a challenge. This was something I had done for years, religiously every week. So although I had the most exciting thing happening to me, Pole was what made me feel good, feel myself and it took some getting used to. I missed my passion and I was determined to get back to it once baby was here. Fast forward to June 2017, we had a beautiful 4 month old baby girl called Williow-Ivy. I decided to do it. The first challenge was to squeeze back into my lycra hot pants which to be honest was a terrible sight, I decided to give myself a break and buy the next size up. I was ready, time to head out for an hour of 'me time'. I was torn at first, I didn't want to leave my little girl. Most people who have had a baby will know that the first time you leave your baby, even just for an hour is nerve wracking, even though it was with her daddy who is more than capable. But I had the added nerves of getting back on the Pole! What if I couldn't do it!! So I rocked up feeling like a complete newbee again. I was greeted with huge hugs and kisses from some of my fellow pollers. There were some new faces too! So here I go, I had done zero exercise, other than lug a baby about in about a year! BANG, well thats a shock to the system! I can barely lift myself. Panic, I wasn't confident anymore. I had had Williow-Ivy via C section and I thought I was going to damage my stomach, reopen the wound. I was petrified of getting injured and therefore lost the mental strength it took to do it. Every single muscle in my body hurt the next day. I was sad and upset that I had lost my 'pole-jo', and all my strength. I felt defeated. But I was determined not to give up. 12 weeks after a c section is still very early days and I knew I had a big steep mountain to climb in front of me if I wanted to get it back. After a few weeks in my confidence slowly grew and so did my strength. It did, on occasion cross my mind to stop and do something else but im glad I didn't. I love it and you should love what you do. It makes it much easier to work really hard to get back when you have such a huge passion for it. What I came to realise is that nothing comes to you over night, you have to work hard. Our bodies are such amazing things and they will happily be retrained, it just might take them a little longer after they've been through so much. 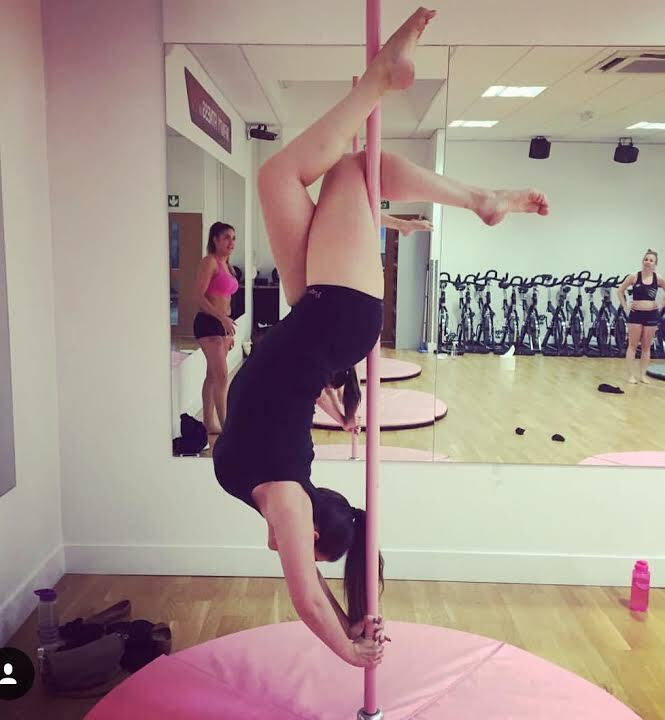 But to say i've made a baby, and was back on the pole giving it at a go after 4 months will be something that I am always proud of myself for achieving. I just shows you you really can do anything if you put your mind to it. I really recommend Pole fitness. It is perfect for anyone looking to try some fun exercise, and to have a laugh. I urge you give it a whirl, plus there is so much support from other women which is the main reason I love it.